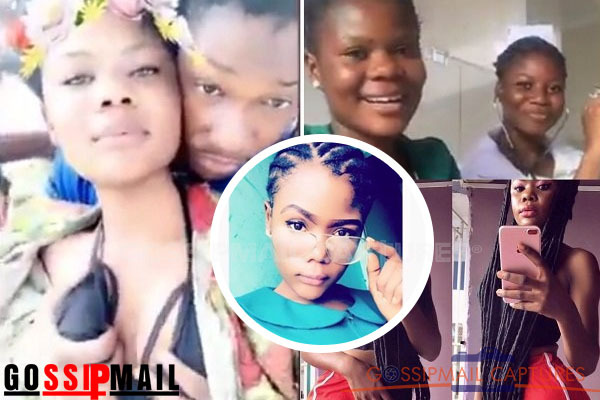 Ghpage.com yesterday posted a video of a Ghanaian nurse known as Trudy which has gone viral where she was seen streamed live on Facebook whiles on official duty. The video which was posted on Ghpage.com official Facebook page has become the talk of the town with thousands of views and comments as people Ghanaians expressed disappointment in the act of the nurse. The majority of viewers have slammed Ewurama, stating her act was unprofessional, to say the least, and insisted authorities should punish her to serve as a deterrent to others. Later in the evening Ghpage.com posted another video of the same lady, this time, spotted with D-Black’s Black Avenue Muzik newest signee, Dahlin Gage, romancing everywhere they go. [next] Photos of the said Nurse who streamed Live on Facebook whiles on duty that everyone is talking about.